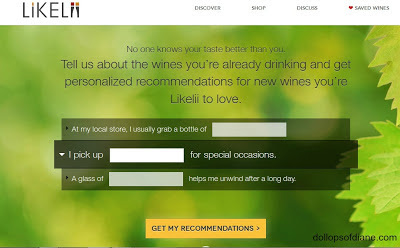 Dollops of Diane: Likelli: Personalized WINE Recommendations for YOU! Likelli: Personalized WINE Recommendations for YOU! Are you like me and tend to drink the same few wines simply because you know you like them? Do you get somewhat freaked out when you enter one of those big liquor stores with the endless aisles of wine? I mean really, how do you choose? Have you ever tried looking up information online for wine recommendations? It can be overwhelming and daunting! Well…enter Likelli! Likelli is a women-founded start-up that aims to help wine drinkers explore and try new wines. They help to take the guess work out of choosing the best wine for you. They believe that the “best” wine isn’t determined by ratings or what professional wine critics drink. It's determined by your input! Simply head to their website and it will ask you for one or two wines that you enjoy drinking. Based on what you like, they’ll help you find wines that are compatible with your palette. No more guess work in aisle 5! As you try and rate more wines their recommendations get better and better for you. Once the wine recommendations pop up you can then save them, print them, or wait for it…wait for it….order directly from Likelii! They recommend a wine, you pop it in your shopping cart, and they deliver it right to you. Already know what you want and don’t need a recommendation? Well then just order away! You can search by whites, reds, or regions. They also are currently offering free shipping on items over $100. Sounds like it might be time to order up a whole bunch of wine before the busy holiday seasons arrive! Also, head on over to their Facebook page to find out how you can enter to win FREE wine - woo hoo!